Fresh, undiscovered photographs by Gerry Deiter and a remarkable first-person story shed a new light on John Lennon and Yoko Ono’s peace efforts in 1969. 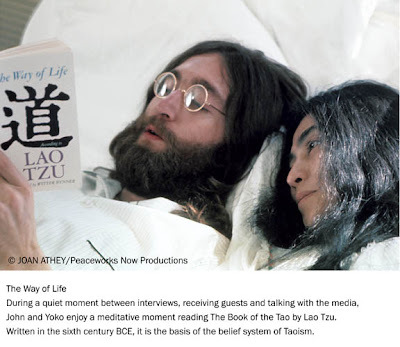 WAR IS OVER (If You Want It) is a new component of the popular exhibition, Give Peace A Chance: John Lennon and Yoko Ono’s Bed-In For Peace, curated by Joan Athey of Victoria B.C., and circulated by ArtVision Exhibitions, LLC. Another new interpretive component is an extraordinary mural by accomplished graphic designer, Wolfram Schramm of Gerlingen, Germany. The expanded exhibition debuts October 9 in Illinois at the Lake County Discovery Museum near Chicago, in time to celebrate Lennon’s 70th birthday. Through an amazing synchronicity, Athey discovered John Kosh. Known simply as "Kosh," he is a renowned documentary filmmaker living in Los Angeles. His pedigree as a designer of album and CD covers for a panoply of the biggest rock bands in history is legendary. As a multi-Grammy® award-winner, he has seen it and done it all. According to Kosh, working with John Lennon was the adventure of a lifetime. His candid recollections of the years he worked with Lennon and his pivotal role in the WAR IS OVER campaign is described in images and an essay to be mounted for the public for the first time at the upcoming exhibition at the Lake County Discovery Museum in Wauconda, IL. "Let him be, set him free, let him be like you and me."